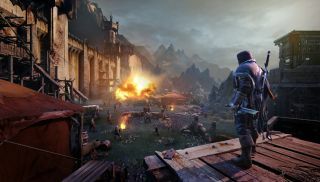 Monolith has rolled out a new trailer for Middle-Earth: Shadow of Mordor at Gamescom that takes a closer look the singularly unpleasant minion of Sauron who murdered Talion's wife and son. I'm still not entirely sure why Talion, the central figure in Shadow of Mordor, finds it so difficult to die, but it's a little clearer now why he's so hell-bent on killing everyone else. "Where was your bravery when we bled your wife, and gutted your son?" the Black Hand asks. And in Middle Earth or anywhere else, those are some serious fightin' words. Speaking of fighting, there's a good deal of that in here too, but that's not too much of a surprise, is it? This is a game about chopping men and monsters into tiny bits and pieces, after all. Middle-Earth: Shadow of Mordor comes out on October 7.